School is now in full swing; I suppose my 1-book lead on my Goodreads Reading Challenge won’t last long. As I type this, Goodreads says I’m “On Track” so I my lead is gone but I also haven’t fallen behind . . . yet. 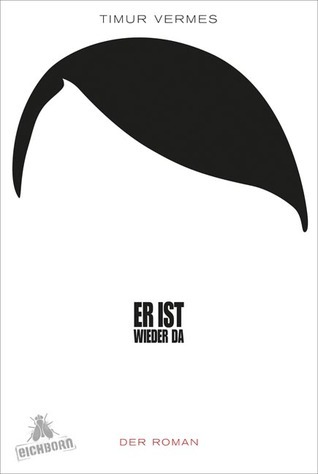 This week I’m reading Er Ist Wieder Da (English Title: Look Who’s Back) by Timur Vermes. Berlin, Summer 2011. Adolf Hitler wakes up on a patch of open ground, alive and well. Things have changed – no Eva Braun, no Nazi party, no war. Hitler barely recognises his beloved Fatherland, filled with immigrants and run by a woman. People certainly recognise him, albeit as a flawless impersonator who refuses to break character. The unthinkable, the inevitable happens, and the ranting Hitler goes viral, becomes a YouTube star, gets his own T.V. show, and people begin to listen. But the Führer has another programme with even greater ambition – to set the country he finds a shambles back to rights. every night, we are the dachshund." I’m reading this in German, but it’s been a while since I’ve read anything in German, so my translation isn’t quite accurate. Hence, I’m unsure of the exact translation of einspeichelnd. The last phrase probably refers to the original purpose of the dachshund: hunting and catching varmints. Native German speakers and readers, feel free to correct my rough and probable crude, inaccurate translation. I’m just finished reading July 1914: Countdown to War by Sam McMeekin; I gave it 3 stars – mainly because the last 80 pages or so just dragged on and on and on and on. The last three pages, though, were excellent and saved the book from a 2-star review. Now I can start serious reading of Chaucer’s Tale: 1386 and the Road to Canterbury by Paul Strohm.